Halo Engagement Ring with Round Diamond Accents | Shane Co. 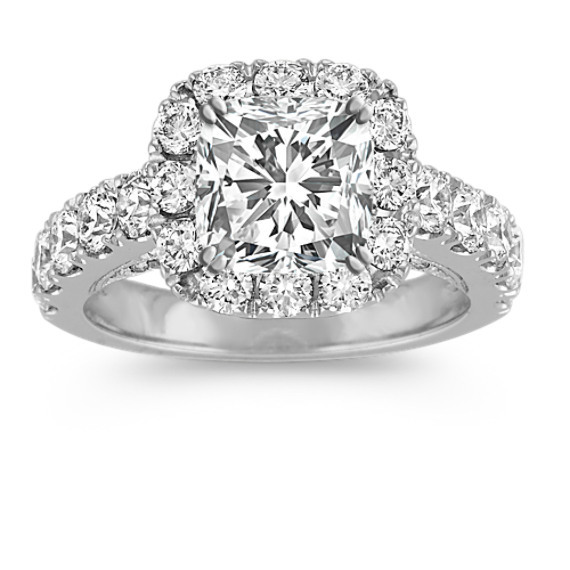 This exquisite engagement ring will provide ample sparkle to surround and accent the center diamond of your choice. Forty-eight round diamonds, at approximately 1.63 carats total weight, have each been hand-selected for exceptional brilliance and are crafted in quality 14 karat white gold. Popular choices of center diamond shape for this setting include cushion cut, round, and princess cut. This setting allows for your choice of diamond shape ranging up to a 1.50 carat in size. Part of our Hollywood Glam Collection. M husband and I are celebrating our 5 year wedding anniversary and he spoiled me with this upgrade ring!!! WOW WOW WOW is all I can say. Mu husband and I are celebrating our 5 year wedding anniversary and he spoiled me with this upgrade ring!!! WOW WOW WOW is all I can say.